Roasted sausage with garlic and cherry tomatoes | Food E.
In any case, this takes an hour to roast but about 5 minutes to prepare. All you need is a roasting pan or an ovenproof skillet and you’re good to go. Preheat oven to 425. Prick each sauce a few times on each side with a sharp knife or toothpick. 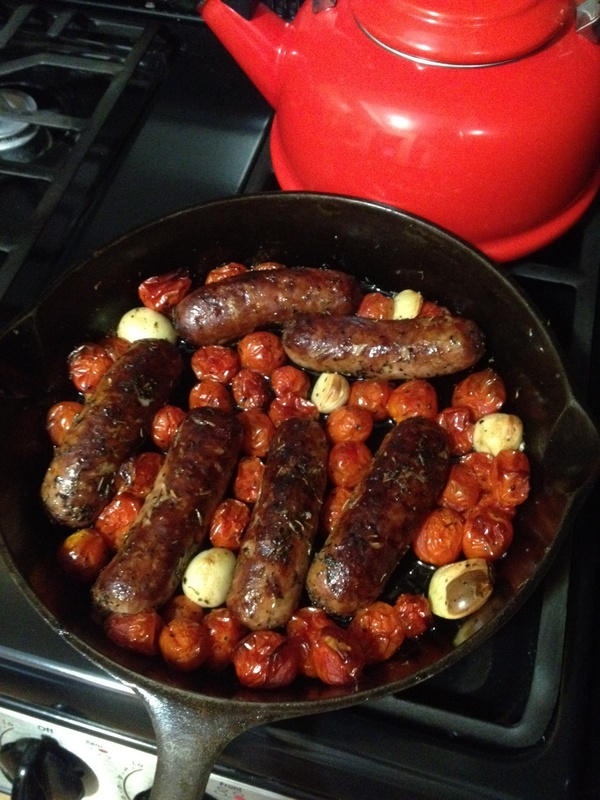 Add sausage, cherry tomatoes, garlic cloves, and spices to a roasting pan or ovensafe skillet. Pour over olive oil and balsamic vinegar. Using your hands*, toss until the herbs are distributed and everything is coated in olive and vinegar. Make sure everything is in one solid layer in your pan or skillet. Bake for 30 minutes. Flip sausage and roast for another 30 minutes. Serve over small pasta or beans or wilted greens. Splash a tiny bit more balsamic if desired. *Do not use a spoon and deprive yourself of the slippery, crazy-cool feeling of tossing all this together with your hands. You’re giggling thinking about tossing slippery sausage with oil (hardy har har) but sexual undertones aside, it just feels so dang cool! Seriously. Okay, you’re still laughing. Fine fine, the cheese stands alone.